Mrs. Morlock’s kindergarteners proudly show off their Wolverine Pride T-shirts! WDC Elementary students received an amazing gift last week. Local businesses donated Wolverine Pride T-shirts to every kid once again! Ewert and Schmidt started this project three years ago and it’s still as exciting for our little Wolverines to receive their new T-shirts! Gold T-shirts with “Wolverine Pride” on the front were handed out last Thursday to some very excited kids. Kids were able to wear their tees to the Homecoming parade to proudly display their WOLVERINE PRIDE! Amanda (McManigle) Schmidt came up with the idea after seeing several kids at a football game without a WDC T-shirt. She shared her idea with good friend/WDC 2006 classmate, Brittney (Schmitz) Ewert, who ran with the idea and asked local businesses to chip in on the cost of buying 600-plus T-shirts. This is the third year -- and about 1,700-plus T-shirts later! -- that Wolverine Pride T-shirts have been given to WDC kids. "No little Wolverine will be left behind" is what Schmidt likes to call her beloved T-shirt project. And she can't help but tear up when talking about it and how much this means to the kids and how much they love it. "It's a project that is near and dear to my heart along with the other businesses that make this possible. I am forever a WDC Wolverine!" For Brittney Ewert, she loves to see the smiles on their faces and their excitement. "It may be a simple T-shirt to us, but to them, it's much more than that. Some kids don't have blue and gold in their wardrobe, so we're very happy to provide them with a T-shirt to wear on spirit days and throughout the year," Ewert said. 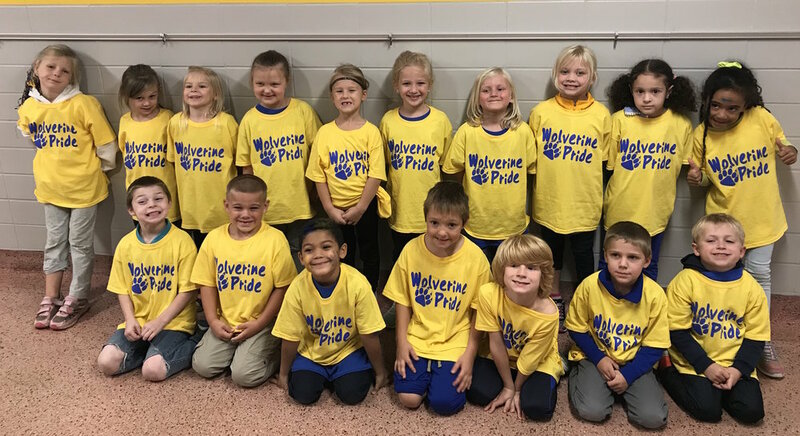 WDC Kindergarten teacher Danielle Grieger said her little Wolverines were thrilled when they received their new T-shirt! In fact, one of her students was returning the shirt on Friday after school. "I said, 'No, you get to keep it.' She replied, 'Really!??! Awesome!' "
Teachers said they heard countless comments like "Awesome!" "How cool!" and "That was really nice!" from their grateful students. WDC cannot thank the following businesses enough for their generosity and for their amazing support! Mrs. Berg’s fourth-graders looking sharp in their new Wolverine Pride T-shirts! They also posted a thank you on their erasable whiteboard. WDC National Honor Society inducts 18 new members!